A new mobile ad platform unveiled today promises to help marketers reach target audiences wherever they are, down to the neighborhood level. San Francisco-based startup Moasis Global provides technology for delivering advertising or content in real-time to predefined locations or “grids” as small as two city blocks or as large as a region or country. By showing consumers relevant ads or promotions in proximity to small and mid-sized businesses, other marketers can drive more foot traffic and higher revenue. Or at least that’s the idea. The company points to research indicating people spend 80% of their discretionary income within 10 miles of their homes. “Our goal is to create the intersection where data and delivery meet. So it gives the marketer, regardless of size, the ability to discover their consumer and react, and deliver on a product right away,” said Moasis co-founder and CEO Ryan Golden, who previously founded branding firms Syner(G) Group and Alife Group. His background includes a stint at Tribal DDB. 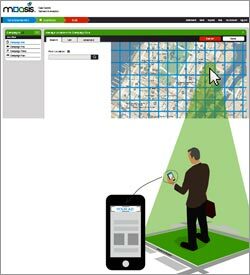 Through the company’s Geo-Grid display platform, businesses or agencies use its Web-based dashboard to determine a campaign budget, bid in real-time on one or more grids, and set parameters for ad timing and other criteria. Once an advertiser reaches its spend limit, or gets outbid, the ad comes down. Advertisers aren’t charged for ads that get no views. Ad rates through the system, now in beta, otherwise typically run at CPMs of about $40. Moasis has teamed with ad exchanges such as Nexage, OpenX and Smaato to connect its platform to RTB marketplaces and source mobile inventory. The company is relying on first- and third-party behavioral and social data, as well as location information via mobile users’ GPS, Wi-Fi triangulation to target ads. Moasis’ hyperlocal approach to mobile advertising is similar to other ad tech firms, such as PlaceIQ, which target ads based on 100-meter square geographic areas called “tiles.” Golden suggested that Moasis provides a more comprehensive solution that goes beyond location data to provide campaign management and ad delivery. Like PlaceIQ, Moasis emphasizes that its platform is privacy-safe because it isn’t tracking personally indefinable information (PII), but profiles built from generalized, anonymous data. In addition to devices like phones, tablets and laptops, the company says ads can be served to other platforms like streaming video and audio services, transit system signage and digital billboards. At present, Moasis is running a test in connection with the Summer Olympics that would allow advertisers to target messages to people by sports event venue in London. “We’re working with our exchange partners which have access to millions of impressions in the U.K. area,” said Golden. He added that Moasis is more broadly in talks with publishers, ad agencies and businesses to expand its reach. The company offers a self-serve tool for small business, while agencies can connect to its Geo-Grid system directly or through an API (application protocol interface) plugin for agency trading desks. Moasis is demonstrating the system for agencies and advertisers while in beta but said it didn’t have any preliminary campaign results to share.